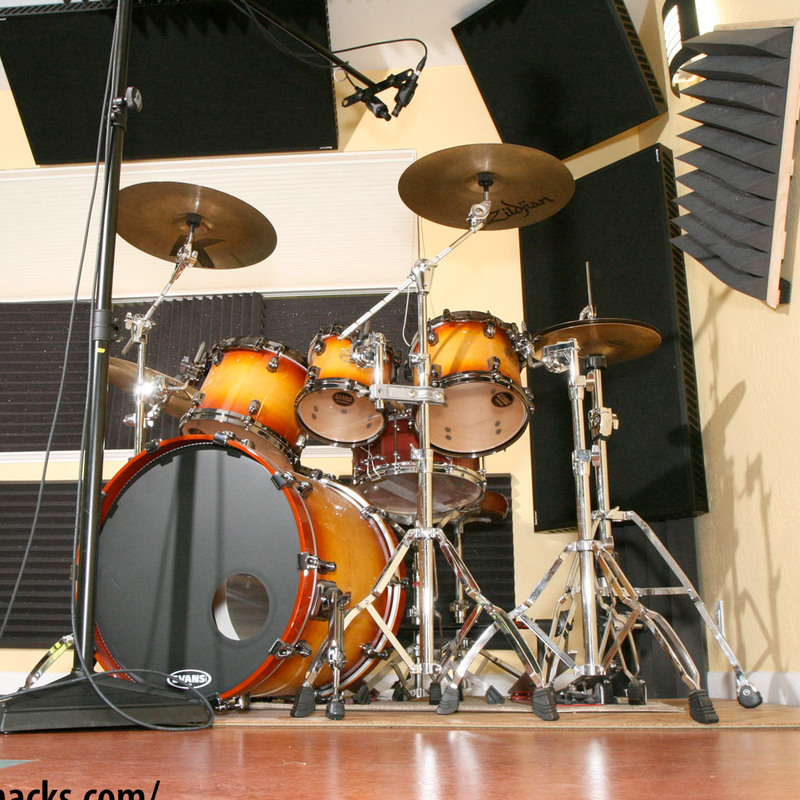 I often read mic reviews, but sometimes find them hard to relate to because many of the engineers who write them are working in a much larger room than I do, or because they are often recording rock/pop bands. 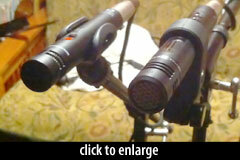 Maybe they have a cornucopia of vintage mic pres or compressors, and they are usually working on a big desk… if only! It is always better when you don’t have to rely entirely on virtual instruments. I have certainly spent a small fortune on virtual instruments to help out with many of these challenges, but my main instrument is guitar and I manage to ‘fake it’ on a lot of other stringed instruments (bass, baritone guitar, fretless bass/guitar, banjo, mandolin, ukulele, oud, and some antique and homemade instruments). So I’m often recording these stringed instruments as well as a variety of small hand percussion instruments. My philosophy in creating music for any medium is that it is always better when you don’t have to rely entirely on virtual instruments. So I try to record as much as I can. Time is always a consideration, because I usually have very short turnarounds for a lot of the work I do. So when I’m recording a part, I need to get to a good sound and I need to get to it quickly. 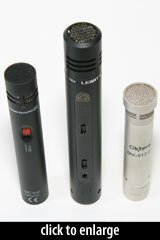 So it’s great to know what type of mic to go to, depending on the source. 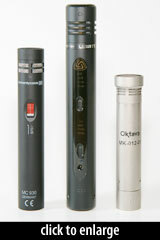 Fortunately I had the chance to audition several really wonderful FET Small Diaphragm Condensers (SDC) recently. 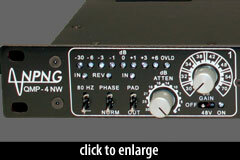 I used an NPNG DMP-2NW 2 channel mic pre, on loan from my pal Dan at Mercenary Audio. The first few samples on acoustic guitars were different performances (yeah, I know, I hate that too), but the hand percussion/ukulele was A/B’d on the same performances. Unlike the Oktava, the Lewitt 340 has some flexibility built in with backlit switches for a 4 way attenuation pad, and 4 way hi-pass filter. 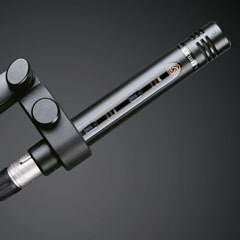 Not to mention, this is one of the beefiest, most tanklike SDC mics I’ve ever picked up! For the samples I left everything at the default (0 dB attenuation and the hi-pass set to ‘flat’). Listening to the Lewitt I noticed a few differences from the Oktava: the LCT-340 had an increased clarity and detail in the high end and a pleasant bump in 150k–200k range. Where the MK 012 tends to start blurring that high frequency detail a bit, the Lewitt brings it into focus a little more. Now this is where personal taste comes into play. While I was setting up the Lewitt I found myself getting lost in playing the acoustic guitar, experimenting with the mic, its placement, and the guitar dynamics. In fact, my left brain had to sort of step in, take over and get back to business because I found myself getting carried away with ideas. I think whenever a piece of gear starts inspiring your creativity and gives a little spark, it is always a good thing. 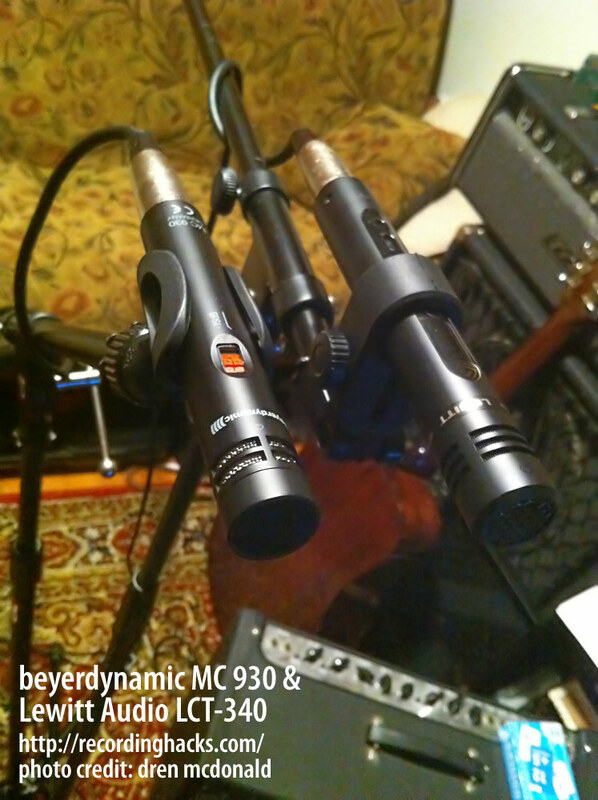 The beyerdynamic MC 930 also has a built in switch for pad and hi-pass filter (3 position, instead of 4). At first I was trying to stick to my rule of leaving the on board switches at the default, but I couldn’t. The 930 has a whole lot of output! So I engaged the -15dB pad for the recording, otherwise I was going to be attenuating all over the place. I found the 930 to be very similar to the Lewitt, although while it may have revealed even a bit detail and felt cleaner, I wasn’t as happy with the 930 (especially when strumming) as I was with the Lewitt. 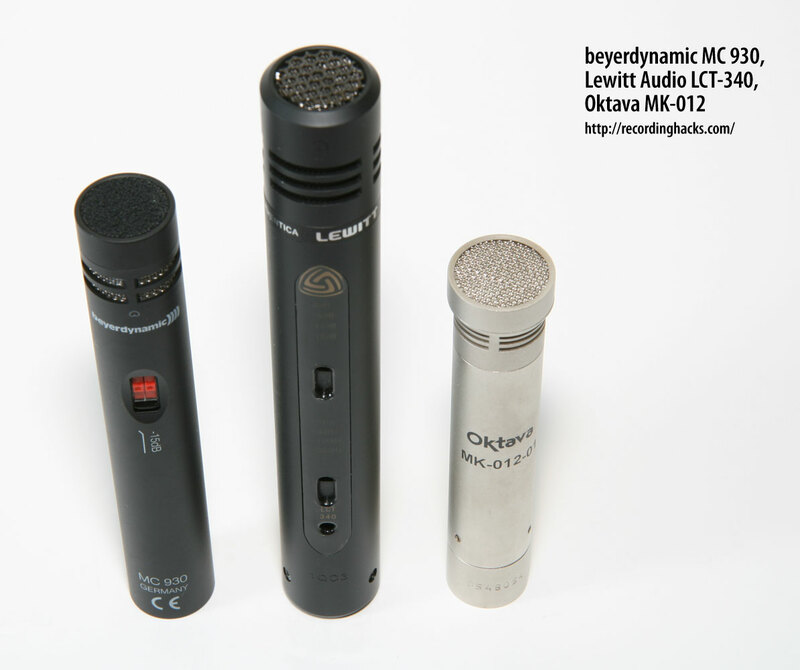 So when it came time to do some hand percussion tracks I felt like the Lewitt and beyerdynamic were extremely close in terms of what they offered. So I decided to test them together, side by side, on the same performances. So I balanced the 2 channels on the NPNG to each mic level (930 continued with the -15dB pad engaged), and started recording. In this case, the ‘sterility’ that I had experienced with the stringed instrument tracks through the 930 became a quality I enjoyed on the shakers and maracas. Even the key jiggling. While there was certainly nothing lacking with the Lewitt, the 930 brought a presence to the percussion instruments that I felt would sit well in a mix. I don’t record drum kit in my studio, but I would imagine both the Lewitt and 930 would be great choices for overheads. 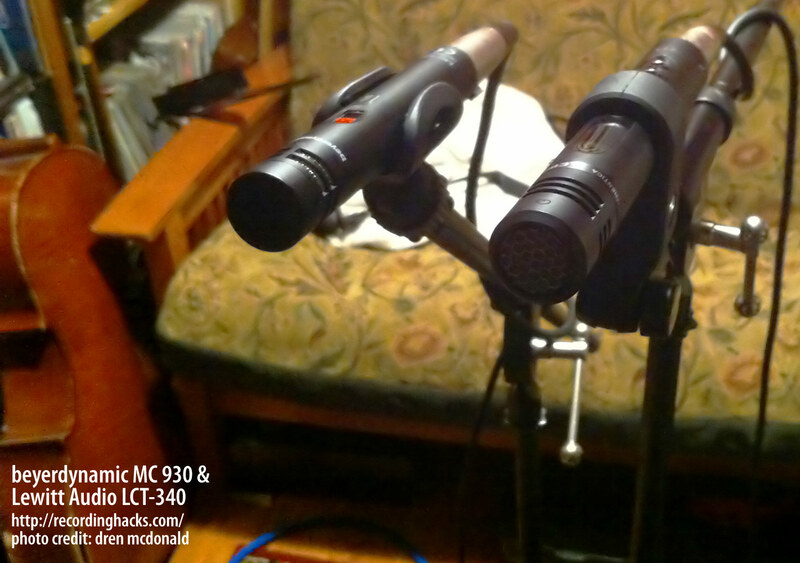 [The MC930 is indeed great for drum OH; hear it in a blind shootout: MC930 drum overhead review. –Ed.] I also tried out a little ukulele and really liked the results from both mics. The Lewitt may have been slightly mellower and buttery (can I say that about a mic?) but I thought they both captured something that I’d be happy to throw in a mix. Depending on the number of flavors you like to have available in your mic locker, I could see owning all of these. Depending on the number of flavors you like to have available in your mic locker, I could see owning all of these. I certainly would be happy having that option. While the Lewitt inspired some experimentation and sparked my imagination with the acoustic stringed instruments, the 930 has a lot of flexibility, especially in terms of recording quiet sources while retaining a low noise floor. In fact, I would consider the 930 for recording many indoor sound design sources, like cloth or paper foley. Everyone has specific needs in their recording environments and in the sources they need to record, and hopefully this gives you some insight into the different personalities each of these FET SDCs have to offer. Previously: Welcome Shure Notes Readers! Could you contrast these to the SM81? I have two of those. I love the sound of my guitar but I can’t get the clarity I am looking for. I am trying to decide if I should look into another guitar or try some more mics. I get close to what I am looking for but I have this veiled lower midrange. I took a lot of flack over the crappy sound it produced. The explosions sounded like somebody coughing. 🙂 Back then there was no sampling and I invented some one-note-at-a-time music. It was pretty bad. Game sound now-a-days is amazing. Do you have a list of games with your stuff in them? @big dave, I haven’t used the SM81, but if yer happy with yer guitar sound, maybe you should try another mic or mic pre. if you do a lot of finger picking stuff, you may like the 930, or if it’s a lot of strumming, the lewitt or mk-012 might be up yer alley. what sort of pre are you using? @robert – there’s a list of stuff I’ve worked on at my site, nerdtracks.com – recent work includes “Ravenwood Fair” (facebook game), “Skulls of the Shogun” (XBox/PC/Win7 – due in Jan ’12 – skullsoftheshogun.com), Idle Worship (facebook game releasing this august) and Zoo World 2 (facebook game) – game sound HAS come a long way, and it’s great to see more and more game developers investing in the audio side of games. I would’ve had a tough time creating game audio 30 years ago! Thanks for your review! Also how do these compare to the Miktek C5’s? I’m going to be recording choirs, solo voice, acoustic guitar, and piano. 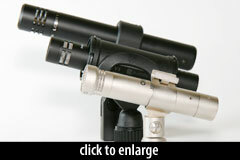 Or would a better option be something like the Lewitt LCT 640, Lauten Atlantis, or Miktek CV4? Thanks for the advice! I really love the piano tracks that I heard for the 640. The Atlantis seemed maybe a little dark and less versatile, and the CV4 sounded clear, but the 640 has a much lower self noise. 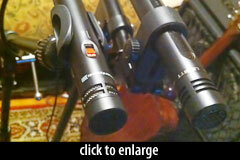 Does that figure make a big difference when recording in not-so-ideal acoustical environments? Hi 207, the lower self noise of the Lewitt doesn’t help with bad acoustic environments, but is very useful if you have to mic quiet or distant sources and have to use a lot of pre-amp gain. The 640 has a lowish output too, which explains why this mic benefits from low self noise stats. The feature on the 640 that might help with not-so-ideal acoustics is the tight cardioid option which should cut out much of the room noise. I also tested the first Atlantis to arrive here in the UK and with it’s Forward pattern engaged it is far from dark, it’s bright and smooth like a Brauner Phanthera. I really liked the neutral option on the Atlantis too. (It has 3 tone options, Forward, Neutral, and Gentle).The main thing that put me off buying a pair was the fact that the mic is huge and heavy. 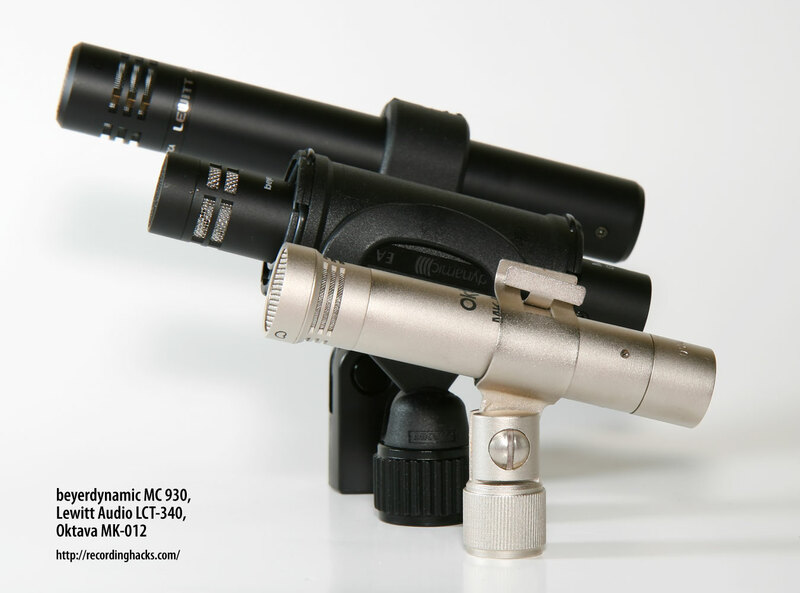 The Atlantis looks great, don’t get me wrong, but I have a preference for smaller lighter mics, like the 640 or a 414, or Phanthera V etc. I am looking into an LDC / SDC x 2 combo. Does LCT640 / LCT340 x 2 seem like a good combo? Or, would the LCT 840 /LCT940 be worth the added cost? The heaviness of the Atlantis does seem like something to consider; especially for sessions where there is minimal setup / breakdown time. 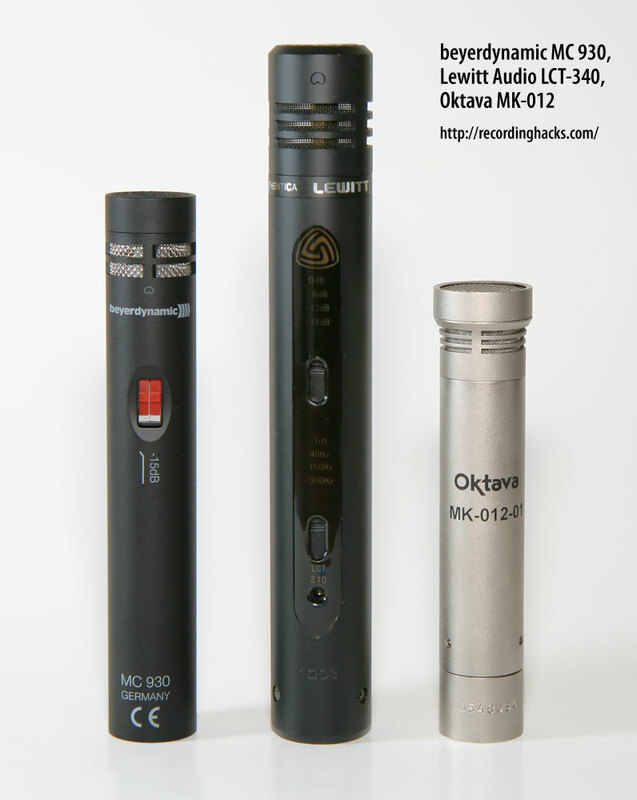 Another combo that seems good is Miktek CV3 / Miktek C5 x 2.